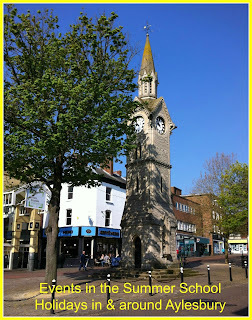 My previous posts with events over the Easter and May half term school holidays seemed to be popular, so I have compiled a list of the activities and events going on in and around Aylesbury during the Summer School Holidays. 30 minute workshops throughout the day. Each week there is a different theme: Coral craft, Snapping Sharks, Butterfly Feeders, Monstrous Models and Fossil Folklore. Some activities are suitable for all ages, others for ages 5 and over. Cost: Museum entry is free. Workshops are £2 per child. Cost: Prices start from £3, cake and coffee included. Organised by Bearbrook & Elmhurst Children's Centres. Crafts, Messy Play, Face Painting, Bouncy Castle and more. Fancy dress optional. Organised by Berryfields Children's Centre. Come along for a fun morning of baking and other activities for children aged 2-5 years. There will be some activities for siblings. Organised by Waddesdon & Whitchurch Children's Centre. Music, dance and drame from Noizee Productions. Inflatable fun from Bucks Play Association. Craft activities from Wider Family Learning. Ice cream from The Works. Plus a Teddy Bears Picnic - bring your teddy and packed lunch. Cost: Free but event is ticketed. Ring 01296 655218 for ticket information. Red Kite Children's Centre are hosting a Play day with lots of different activites on offer to try including drumming workshops, bouncy castle, mud kitchen, rugby, football and lots more. Organised by Aylesbury Vale District Council, there are kids event with free activities in Aylesbury town centre every Thursday. 23rd July - Madcap Thursday. 30th July - Magical Thursday. 6th August - Zoomungous Thursday. 13th August - Thrill-Seeker Thursday. 20th August - Speedway Thursday. 27th August - Bouncetastic Thursday. Five weeks of fantastic fun to keep the whole family entertained. Discover Dahl’s wondercrump stories, brilliant Bucks wildlife and making musical instruments. No need to book. A fun-packed afternoon with activities including falconry displays, magic shows, Punch & Judy and crazy golf. There will also be fun games to play, face paining and giant inflatables. There will be a selection of animals for the children to learn about and some can even be touched. Cost: £2.00 per family. Must be booked and paid for in advance. A fun packed family day of activities and entertainment, to celebrate National Play Day, brought to you by Mix96 and Aylesbury Vale District Council. Activities include arts & crafts, bouncy castles, giant sand pit, inflatables, a climbing wall, face painting and lots more! Each week there will be a great activity for the kids to do; street art, recycled robots, funky fashion and percussion instruments. Come along for a fun morning of activities including a bouncy castle, face painting and crafts. Musical fun for boys and girls aged 0 to 4 years by Jacqu'in the Box. Action songs and rhymes with props, puppets and percussion instruments, dancing and musical movement. No need to book in advance. Cost: £5 per child. Pay on the day. Musical fun for boys and girls aged 0 to 6 years. Go on an adventure with lots of singing, dancing and gentle musical games and activities. Places must be pre-booked with Jacqu'in the Box - Tel: 07948 371615. Cost: £7 per child or £10 for two siblings including a little goody bag. Do you love to Act, Sing and Dance? Then go along to the Susan Diane School of Dance Summer workshops. With action packed days full of drama games, learning popular theatre/film songs and exciting dance routines, and lots more. Suitable for age 6 years and over. Places must be booked in advance. Call 07812 078401 or 07912 093019. Organised by Waddesdon & Whitchurch Children's Centre. Kids can enjoy cupcake and biscuit decorating fun in the Gardener's Retreat Coffee Shop. Includes 1 cupcake and 1 biscuit to decorate, squash/water and a colouring activity sheet. Book at the Gardener's Retreat Coffee Shop. A fun-packed afternoon with activities including falconry displays, magic shows, Punch & Judy, horse & carriage rides and crazy golf. There will also be fun games to play, face paining and giant inflatables. Find out more about what we got up to at Fun in the Park in Black Park last year. A one day agricultural show with animal showing classes and rural demonstrations plus a whole range of family entertainment including the Royal Artillery Band, Bolddog Lings Stunt Team, Cookery Theatre, Home & Garden Marquee and Shopping Marquees. Cost: Adult: £12 online/£15 at the gate. Children (aged 5-16) £5 online/£6 at the gate. Under 5s are free. Family (2 adults & 2 children): £29 online/£36 at the gate. To find out a bit more about this Show, take a look at the post I wrote last year after our first visit to the Bucks County Show. To find out a bit more about this Festival, take a look at Little Miss A's First Festival Experience from last year. A day of continuous live music performed on a large outdoor stage along with traditional funfair rides. Organised by Aylesbury Town Council. Take along a picnic and enjoy watching this fun family film in the outdoors! Tickets must be purchased in advance, see website for details. Cost: £10 adult. £5 child. £25 family. Organised by the Aylesbury Church Network, Fun in the Park is a great afternoon out for the kids with inflatables, games, arts, crafts and the very popular BBQ. We went along last year and you can read more about what we got up to at Parklife. This summer, Dennis the Menace and his friends will be up to mischief in the Shopping Centre! Lots of fun over the summer holidays including the Beano Treasure Hunt. On Friday 7th August, Dennis will be in the centre playing pranks and tricks. Whatever the weather does this summer, you can still go to the beach! Like any good beach, it comes complete with its own carousel, funfair rides, candy floss, ice creams and deckchairs. Time: Mon - Fri 9.30am - 6pm, Sat 9am - 6pm, Sun 10am - 5pm. Cost: Free entry to the Beach. Prices apply for the rides and refreshments. Have fun and get lost in Maize Maze at Millets Farm. This year's theme is celebrating 70 years since the end of WWII. Cost: £6.40 per person. Under 2s are free. Group prices available.